Companies will finally offer mobile optimized versions of their website and most large companies will offer downloadable phone apps on their homepages by the end of 2012. You should. Boston’s a great place to have a wedding. What makes Julia Zhogina one of the favorite wedding photographers in Boston is a sense of style balanced by a sense of humor and a journalistic timing. Taking sometimes upwards of a thousand snapshots before and during the ceremony and reception, Julia hits all of the major accents: putting the finishing touches on the bride, fixing the boutonnieres, the dainty circle of bridesmaids and the rowdy gang of groomsmen. Walking down the aisle, the vows, the kiss, the cake, the dance, the proud grandmother and the angelic flower girl. After all, we want to experience the classic wedding moments for ourselves and share them with friends. But she is also there for the peculiar, casual, intimate, and unrehearsed. A burst of laughter at the groom’s slip of the tongue. A thoughtful father holding an umbrella over the bride who got caught in the rain. An ecstatic ring bearer counting the money he has earned on the dance floor. Old friends catching up. Newlyweds taking in the moment. A tired guest dancing her last dance, high heels dangling from her hand over her partner’s shoulder. Being there is not enough. Focusing the camera at just the right angle at the right moment makes the difference between capturing the whole story and letting a treasured memory slip away. 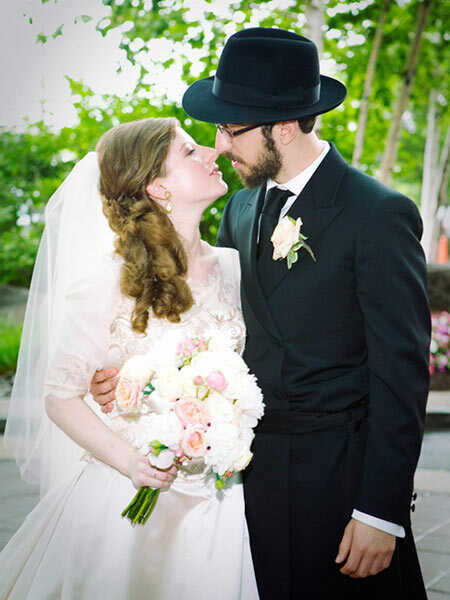 “I take a lot pictures and I delete a lot,” Julia confesses to the Boston Wedding Planner. The result is an almost cinematic sequence of high points from which Julia extracts the one that thrills the heart and captivates the eye for generations past and future. To grace the wall of your family room or your Facebook page – wherever you spend your best time. Julia studied drawing, color, and composition at the prestigious Rabints Art School in Moscow. Later, when she enrolled in the New England School of Photography, painting, especially turn of the last century portraiture and landscapes (Korovin, Modigliani), influenced Julia’s artistic style. Why photography? “It’s creativity and science,” she explains. The creative touch begins at the tripod, but it doesn’t stop there. For every hour of taking pictures, Julia spends another hour cutting and finishing her photos. Julia is the is the master and the hopeless slave of the candid shot. Her quest for the essence of people and places has taken her to every part of the world. Whether roaming the Afghani countryside or stationing herself just outside the wedding cake at the Taj ballroom, she prefers that her subjects forget she is there. To prepare for the wedding, Julia asks questions about the families and learns the names of the wedding party. For starters, she learns who should (or shouldn’t) be in the same photo with whom. But also – where to put the accents. Do the bride and groom love to dance or do they both feel like they have two left feet? Do guests want to pose for portraits or do they prefer to be surprised? Wedding is a traditional business – for the most part. Nonetheless, Boston Wedding Planner asked Julia if she noticed any changes or trends coming up in the ten years she has been photographing weddings. The newest décor trend? Lighting. Many floral shops now offer full event design including lighting. Lighting makes a great addition to the atmosphere of the room, according to Julia. And a life-saver for the after-dark photos. The perennial love story now comes in a twenty-first century flavor. But even if the Internet has “streamlined” the first meeting, what happens afterwards makes a unique and inspiring story. Is the customer who commissions a piece of your art always right? Or is she mostly wrong? When it comes to writing, even though the customer pays my bill, it is the reading public whom I truly represent. So the real question is: who is closer to the target audience, the client or I? The answer is both are closer! She is closer because it is her industry, her customers, and her life where she spends most of her time and where I am only an occasional guest. I am closer because of my vantage point. Being an outsider can be a plus when it comes to filtering out biases and assumptions. Because she does this all the time, she rarely misses. On her worst day, the most confident CEO couldn’t fly past her a social media marketing plan that sold the wrong message to the wrong crowd. Sometimes she worries about being difficult. Another friend of mine figured out how to address that part. Louise Élisabeth Vigée Lebrun, a French-born court painter, who lived a long and happy life spanning Louis XVI, the Revolution, Napoleon, Restoration, and Louis Philippe, recommends flattery to help the client overcome the discomforts of sitting for a portrait. A wise and experienced soul! People deserve to feel good about themselves. It helps them through the trials and tribulations of business and politics. Indulge them with your conversation, but never lie with your paintbrush! A dream wedding is something that holds a personal meaning and a lasting memory for all present. Sometimes we choose exotic locales. Often we write our own vows. 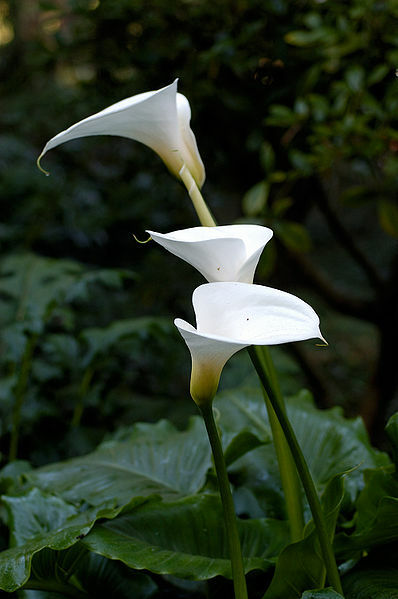 But in the end, it is two things that give a western wedding – traditional or not so much – its visual signature: the white dress and the flowers. What about dressing your whole day in a way that’s symbolic, intimate, and resoundingly one-of-a-kind? Imagine welcoming your guests into a place of striking contrast with the everyday – yet living and breathing the best of who you are? Would you know where to find it? Meet Faxon Green, the woman whose passion is to give color and texture to weddings and special events. Faxon is not just about flowers and tablecloths. She is about your mood, your esthetic sensibilities, and your story. She is also about nature: discovering, delivering, and protecting its precious gifts. The first rule in Faxon’s studio is to work strictly from her client’s unique character and ideas. Not only does she not use any formulas, or floral clichés – Faxon makes sure none creep into her work by accident. Her secret is a process she describes as a conversation with her client – that’s collaborative as much as it is imaginative and intuitive. She starts with a questionnaire to find out all about your event. Next is usually a meeting at the venue or the Boston Bridal Lounge. Then Faxon does something no one else in the industry does. She takes you to the flower market. To watch your reaction to different flowers, as you try them on for a “fit”. To take pictures of you and your special people with the flowers. The time you spend with Faxon at the Boston Flower Exchange is key to the magic she will perform later in her studio. It lets her know who you are in her world. “Naïve” is the last word that comes to mind when you meet Faxon whose client list includes Massachusetts Governor Patrick and the Boston Museum of Fine Arts. Yet she calls herself a “naïve artist,” meaning she taught herself. From the moment she put her first bunch of dandelions into a jelly jar, as a little girl, to studying under gurus like Anthony Ward, to owning a floral design studio – there was never a time in Faxon’s life when she didn’t work with fresh flowers. This work has taught her to find elegance in nature, never to impose on it. Faxon doesn’t use plastic foam to hold in place her arrangements. She calls them “living sculptures.” “If I wake up in the morning to find that the flowers had shifted in their vases from how I had left them the night before – well, that’s just where they want to be!” she says. This deep reverence for Nature’s own way extends into everything Faxon does at the studio. Working with flowers naturally comes with all different shades of green. It also comes with cardboard and plastic packaging, costly air shipments from Costa Rica to Amsterdam to New York to Boston, and, when all is said and done, a product whose useful lifetime is from 6pm to 2am the next morning. Whenever possible, Faxon uses local and seasonal flowers. These are most likely to be grown without pesticides and without the carbon footprint of greenhouses and air shipments. Her next choice are flowers from US and Canada that are shipped directly rather than routed through the international flower exchange in Amsterdam. Faxon uses natural settings – glass, grass, wood, upside down flowers – to hold her centerpieces. She reuses and recycles all the packaging and composts all the plant clippings. Whatever the client doesn’t keep or give away, Faxon arranges to pick up after the event. She donates the remaining centerpieces to drug addict and battered women’s shelters around Boston. The centerpieces and the bridal bouquet are just the first step. Much like a painter who frames his own work, Faxon typically designs the whole table from the tablecloth to the sign the guests will use to find their table. That’s right – to Faxon, the table and place settings is a frame to her floral artwork. If you disagree, you probably have not been to the wedding of John and Sally from Newton, Mass. John – an executive of a well-known e-commerce brand and first-time bridegroom – was in charge of the whole event. “He was very exacting,” Faxon recalls, “and expected to run the design process like a computer program.” Faxon worked with John to create several unique centerpieces to mix and match. The morning after the reception, while the bride was packing for their honeymoon, Faxon received a phone call from John. “We loved it,” he told her. “Our guests loved it.” After the salads, one whole table got up and offered to switch places with another table so that all could enjoy a different centerpiece. Others followed suit. People were rotating through tables all night long. Music, dancing, and table flowers made John’s day what he had hoped it would be. In fact, Faxon usually suggests at least two or three different centerpieces for larger weddings. “The esthetic of the space is better and much more memorable, “ she explains. But it doesn’t take a large wedding to make a great use of Faxon’s talents. Matt and Carol are established artists, both inspired by the great masters of the past. For their wedding, they chose to name the each table after a favorite artist. The table signs had the artist’s name printed on one side and a masterpiece of his on the other. Faxon’s job was to create a unique centerpiece for each table interpreting the painting. “What is the best moment of your career?” I asked Faxon at the end of our meeting. Just as everywhere else in our tech-crazed world, SEO technologies are way ahead of our abilities to use them towards a rational purpose. As soon as we conceive of a new business – or hire a marketing whiz to take an old business “to the next level” – we are consumed with keywords, search rankings, and social media, as if doing exactly what the rest of the world does has ever made anyone rich. Search Engine Optimization (SEO) is a set of web tools and content strategies designed to help your target audience find your site through the commonly used internet search engines like Google, Yahoo, and Bing (Microsoft). It does have the power to dramatically increase web traffic to your site. And for that reason it is just as likely that a search-optimized site will hurt your business, as that it will help it grow profitably. How can SEO hurt your business? Consider a site that is not user-friendly, repels visitors or attracts the wrong kind, has no clear value proposition, isn’t competitive or lacks support to respond to inquiries or follow-up on leads. Would you want to increase traffic to such a website? In short, SEO works best when it is the last rather than the first item on your e-commerce checklist. Yes, there is no end to how much you can spend on market research and usability testing. And yes, many businesses, especially smaller B2B outfits, don’t typically run the risk of seriously damaging their brand with a cookie-cutter website. Even so, there are three commonly overlooked steps that can vastly improve your site’s performance – before you SEO. Ask what you want your website to do for your business. Just because you “have to have one”, doesn’t mean that your website cannot serve some useful purpose. Likewise, just because you have a website, doesn’t mean it can be all things to all people. Remember that your website is only productive to the extent you actively use it to reach out. Fresh content, sales and customer support, collecting and acting on feedback – all require effort and expense. Therefore it is important to set clear and realistic goals for your website and review and revise them regularly. Contrary to popular logic, for many businesses, these three are vastly different and sometimes antagonistic. Selling involves clearly describing, packaging and pricing products and services, to make it easy for the qualified buyer to decide not “if” but “what” he is going to buy. Educating is directed towards prospects at an earlier stage in the buying process. Educational content explains features, benefits, and concepts to those potentially new to the product. It can help earn the prospects’ trust & respect by providing them with useful information. It can also confuse and turn-off a buyer who thought he knew what he wanted to buy. In this case too much educational content can actually hurt sales. Engaging involves getting site visitors’ to act: comment on a blog post, fill out a survey, take a demo – or sign up for the company’s newsletter Engaging can be another useful tool in early-stage prospecting. It can also be a drain on the company’s resources attracting those without purchasing or influencing authority. It is helpful, especially for a small business, to choose one of the three activities as the site’s primary goal. Then the site’s content and SEO can be tailored to a specific stage of the buying process – and upstream and downstream marketing & sales functions can be clearly defined and prioritized. If two or more of these are equally important, each can be assigned to a separate portion of the website (or a microsite) – and treated separately for SEO purposes. Is your blog driving traffic to your site? Is your “About” page driving it away? Web analytics has the answers, but the volume of data can overwhelm you. However, if you know exactly what your site is supposed to do, choosing and tracking appropriate statistics is straightforward and highly effective. For example, if your website’s main job is to educate, tracking time spent on specific articles can help you understand the demand for various educational topics – and configure your SEO accordingly. ‘Keyword density” is a simple and popular way to manipulate search rankings. Because of density concerns, many websites offer just that: keyword soups with little salt or pepper to make them palatable. Check the so-called case studies on most B2B sites: I dare you find one in ten that isn’t a keyword-heavy list of product features. A better tactic is to make sure that content serves its stated purpose first: clear and concise for the “sell” audience, informative for the “educate”, or exciting for the “engage”. Then go ahead and use SEO, referrer sites, or other traffic stimulants. Keep in mind that what you are ultimately trying to optimize is the match between your site and prospective buyers searching the web. In the long run, playing the numbers only drives up competition for each set of eyeballs. On the other hand, careful targeting and readable content will help use SEO techniques to your business’ full advantage. It’s the best place to house your content. Only having your content on websites that you don’t own is like building a house on rented property. While websites are becoming less impactful in the early stages of the buying cycle, they are an increasingly important tool for retaining and servicing existing customers. It’s the one place where you can provide a complete view of who you are, what you do, and what you stand for, which is critical. Think of your website as a home, and your content as the family that lives there. Send your content into the world to socialize, meet people, have conversations, and express opinions, but always make sure it invites new and old friends back home, where you can really get to know them and help them. Don’t expect your content to make many friends if you only let it out to announce an open house or a big party you’re throwing in the hopes of becoming popular. Sacrificed the gorgeous late morning and afternoon to the e-marketing trade show. Not sorry. Great speakers & some interesting exhibitors. Ellen was great at packaging familiar information into useful categories. What is Social Media? It’s networking (Facebook, LinkedIn, Twitter,…), content sharing (WordPress, YouTube, Flickr,…), rate&review (Yelp, HomeStars, TripAdvisor,…), and so on. She hit on all of the fundamentals that seem to elude me, no matter how many times I hear them. The do list: have a master schedule, test best dates/times to post, acknowledge your audience… And lots of new e-marketing ideas and time-saving tricks. Jennifer gave a low down on the new web and media tools out there. Facebook social plug-ins, OpenID (for single, automated ID/password for all of your one thousand on-line accounts), Badgeville (for social rewards & analytics), Meebo, YouTube.com/create (for inserting calls to action into your on-line videos), and many other things I will not try this time around, but will be grateful for the reminder to stay current. 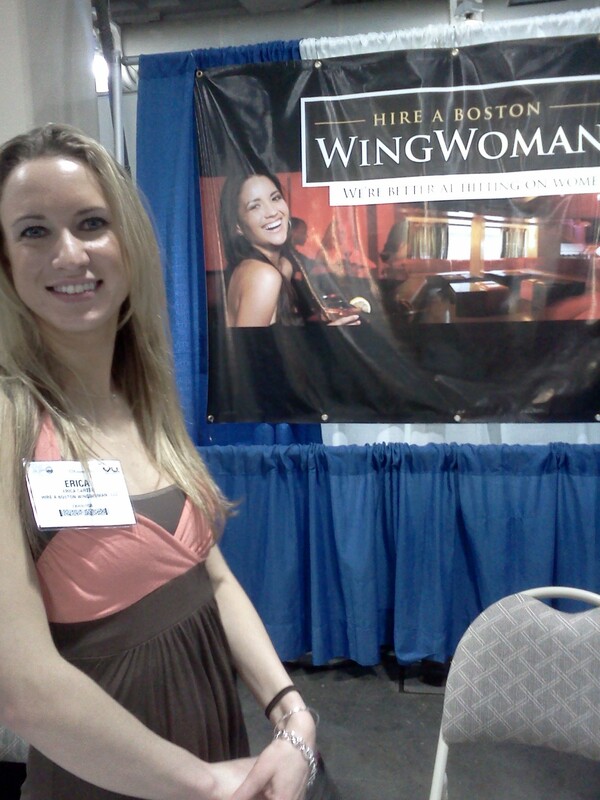 The most surprising exhibitor was the Wing Woman — a strategic resource for single men looking to improve their “hit” and “conversion” rates at the bar scene. For a reasonable rate of $65/30 per hour, one gets “a confident, outgoing woman” by one’s side to “approach other unsuspecting women” on his behalf. Mention this blog and get the first 1/2 hour free!